Isn't it a little insensitive to equate a man lost in time with an event that has "Now" in the name? No matter how often Arnim Zola's twisted creations beat him down, Steve Rogers will always stand up! Now, don't quote me on this, but I think that's a reference to Captain America's first "Marvel NOW!" storyarc, which saw Cap trapped for a decade in another dimension ruled by Arnim Zola? Otherwise that's a really weird choice for a villain to reference on the back of his box. It's not that Arnim Zola isn't a threat, it's just that you would expect them to reference Red Skull, right? Captain America may have a lot of famous, recurring villains, but Red Skull is the top of the evil heap, is he not? Otherwise the box could have just talked about how Cap fights for freedom, wherever there's trouble. Although I think that description may already be taken. If a toy is based on the style of a specific artist, then by all means, it should look like that artist's work. But even if it's not, a little bit of consistency is nice to see; Hawkeye and Ronin are both the same guy, so they should look the same right? It doesn't have to be perfect, but it should at least be close. This figure gets high marks in that area, because even beneath his helmet/mask combo, the face still clearly resembles Series 1's Steve Rogers. See? Consistency. 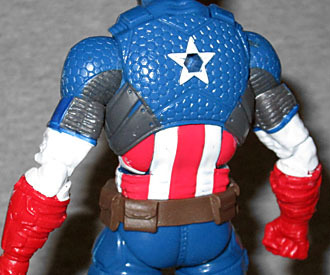 This figure depicts Captain America's "Marvel NOW!" costume, which, like Bryan Hitch's design for the WWII-era Ultimate Captain America, draws inspiration from real-world military equipment, just given a few comicbook tweaks. (Specifically, it's based on Jerome Opena's original design, rather than John Cassaday's take on the suit; Cassaday still draws the upper chest like scale mail, while Opena did it as tiny hexagonal ceramic plates.) It's still superheroic, and it still says "Captain America" when you look at it, even if it doesn't have musketeer gloves. His boots may be red, but they have laces all the way up the front (that end up hidden behind a velcroed flap of armor on the shin). His gloves look armored, and the stars on his chest and back are raised elements. The figure is mostly molded in color, which isn't as much of a problem for Hasbro as it is for Mattel, but still isn't ideal. It leaves most of the colors looking almost comically vibrant. This is a bright figure, but perhaps that was an intentional choice on Hasbro's part, calculated to look more "comicbook-y" - even the areas that are painted, like the stripes on his abdomen, are high-gloss. The white tampos on his helmet are crisp, but you do need to watch out for slop on the usual areas: the stripes, the sleeves, all that. 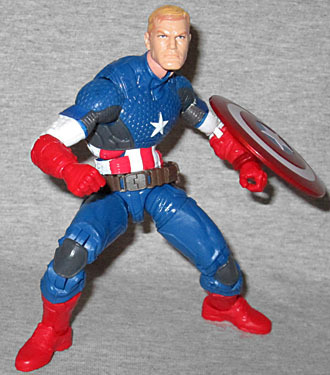 Cap is an all-new mold, of course, so his articulation is up to modern standards. He has swivel/hinge rocker ankles, swivel boots, double-hinged knees, swivel thighs, swivel/hinge hips, a swivel waist, hinged torso, swivel/hinge wrists, double-hinged elbows, swivel biceps, swivel/hinge shoulders, a hinged neck and a balljointed head (but don't expect to pop Steve Rogers' head on there: it's too big to look right). His right knee is a little warped from the way he's posed in the tray, but not terribly so. His only accessory is his shield, the same piece Hasbro has used several times since relaunching Marvel Legends. It can either clip onto his wrist, or be plugged into his back. The red is darker than that used for the costume, but there is a paint error on mine: the white from the center circle is minorly misaligned, bleeding onto the red on one side. I can pretend it's just a highlight, but that's one more thing to look at before you buy. Weirdly, the plastic that holds the wrist clip in place is lighter than the rest of the shield, matching his boots and gloves. The shield may be the only accessory, but it's not the only pack-in. 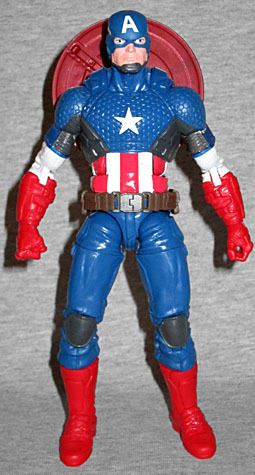 This series has a Build-A-Figure, and Cap gets the head. The head of what? A SHIELD Mandroid. It's a nifty head - very sleek and low - with a big orange eyeslit. 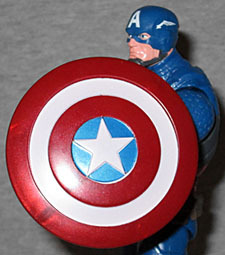 The balljoint socket fits Cap's fist perfectly, in case he needs a second, smaller shield. If not for the BAF piece, I probably wouldn't have bought Marvel NOW! Captain America. Nothing against the costume, I just have enough Caps as it is. And even owning him, he's not terribly impressive. Of course, you know it's a good sign when an action figure with a detailed sculpt, ideal articulation, and a perfect choice of accessories can still be considered "middle of the road." It means things are going pretty well for toy collectors right now.